Nanna re that would leave me sick with sniffles.Slurping a warm stew seemed more enjoyable till the gloomy clouds pass. My pack of Goya 16 bean soup mix had been sitting in the pantry for too long and so was the trusty old slow cooker.Now seemed to be the best time to make a Spicy bowl of stew. Slow cookers are very convenient for busy lifestyles,set it and forget it,unlike pressure cookers,the slow cookers can be left unattended for long hours at low heat.Moist and gentle heat from slow cooking gives ample time for the flavors to infuse yielding a better tasting meal. 1/2 cup fresh herbs like cilantro ,mint or parsley. Heat oil in a skillet and add the cumin seeds along with other whole spices. After a minute add the ginger and garlic paste. saute until ginger garlic is aromatic and roasted,then add the chopped tomatoes,rest of the spices ,herbs and the beans.Transfer the mixture to the slow cooker,add 4 cups of water.Set the temperature at low,cover and let cook for 6-8 hours OR at high for 4-6 hours.Stir occasionally.If using pressure cooker,cook on medium-low heat for about an hour. Mix the lemon juice,garnish with some more fresh herbs ,Serve warm with whole grain bread or dinner rolls. 1 tablespoon milk for brushing. Combine flour with yeast and salt in a large mixing bowl.Add water and oil ,mix well and knead the dough until smooth.Grease the bowl with some oil on the sides and cover the bowl and let rise in a warm place until double its size.punch the air out and transfer on the flour work surface. 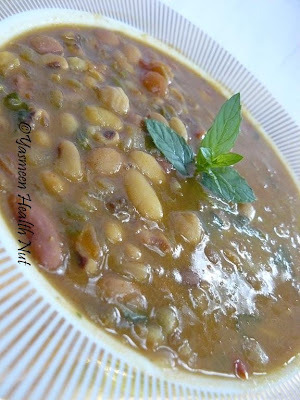 This slow cooked bean soup and the Chicken shorba are my entry for Rahin's slow cooker food event. Soup will also be served at Susan's My Legume Love Affair,13th helping ,hosted by Sunshinemom of Tongue Ticklers. Thankfully ,mostly sunny with clear skies is the forecast for the weekend and I'm hoping for a spectacular July 4th. Beautiful picture of steaming ladle! that is such a lovely and healthy dish and i loved the pic too....i love the lentils and i wish i cud make this soon....When i make it i will let u know.....So many recipes in the ' to try ' list and this is one of them now....thx for sharing dear..
Wow.. Sounds great and healthy! Thats a wonderful healthy dish. Looks delicious. Healthy Stew and fabulous dinner rolls Yas! Thanks for reminding the uses of slow cooker . 16 bean soup sounds healthy. That's perfect meal...healthy and wholesome..looks just fab.. 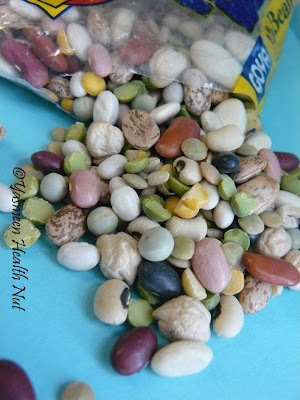 I never knew that there is a 16 bean stew mix. Wow, all those beans together must make a delicious stew and the rolls are perfect with the stew. Yasmeen. u are simply superb. U make the bread too. I thot they were store bought. Good job girl. The is one power packed meal. 16 different types of beans? Oh my, I would just love to have some of this right now. the combo of multigrain rolls with stew is great...my type. This looks like a delicious meal! I love those bean blends, they're so good, and inexpensive too. 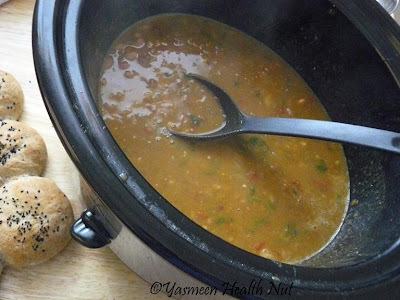 Healthy stew Yasmeen! I too have the same packet of mixed beans in my pantry and I still havent used it. Was planning on making stew for a long time. Slow cooking is a great idea! that's a beautiful click Yasmeen!!!! Nice stew, loved it! Wow, 16 different beans! Looks delicious and I love the picture of the stew in a ladle! Yasmeen, that looks sooooo comforting and perfect for the chilly winter days. Wow, steaming stew.. So healthy one, made easy! Delicious yasmeen@! 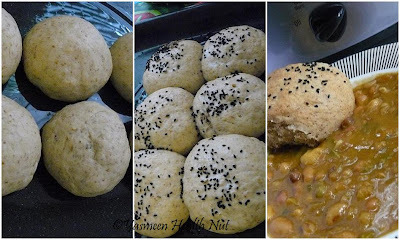 stew with those dinner rolls sounds so good...love the bean mix..
Protine full diet .....looks great and very healthy....wonderful presentation too..
love the first pic. almost grabbed it..hehe :) yummy healthy stew and dinner rolls too. Super mix! stew sounds perfect for the rainy days. Hope you win at the slow cooker event sweetie. Love you. This stew looks fabulous and I love the vibrant color of it! Delicious! Such a healthy and a hearty soup..
Oh...yes...and i hope you had a nice 4th of July :)! Lovely! Thats a wonderful combo! Healthier too!